A pair of 6m tall in ground socketed No 3 rugby goalposts. Manufactured from 2mm thick tubular steel with 7m long x 63.5mm diameter uprights. (6m out of ground). Fully powder coated in white with PVC end caps. Crossbar 5.6m long x 63.5mm diameter with height 3.0m above ground. Steel ground sockets 910mm deep with stabilising fins and base plates. Price is per set of two goalposts. RUG-008. 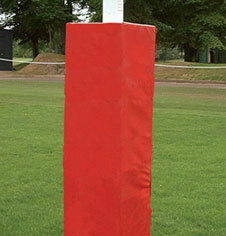 It is strongly advised that rugby posts are combined with rugby post protector safety pole padding. Price + VAT. Includes standard delivery. Prices include FREE standard delivery. Environment aware. Nationwide deliveries. To lower our footprint we combine deliveries into group areas, offering a free 2/4 day parcel service for small items and signature items. (35kgs+ 2 persons) within 7/10 working days. Custom replacements or parts made to order please call. Cataloged items are dispatched within 24 hours of purchase. In ground steel socketed 6m high school rugby goalposts. In ground steel socketed 9m university rugby goalposts. 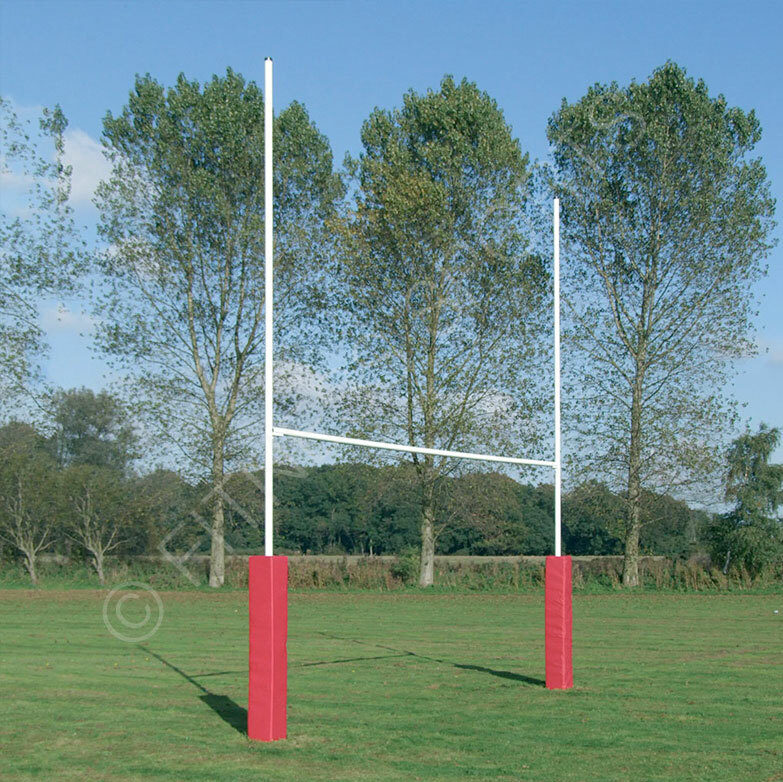 In ground steel socketed 6m heavy duty rugby goal posts. In ground steel socketed 10m & 12m clubs rugby goalposts. 5m lightweight alloy ground socketed rugby goalposts. 6m lightweight alloy ground socketed rugby goalposts. 10m lightweight alloy ground socketed rugby goalposts. 12m lightweight alloy ground socketed rugby goalposts. 7m steel hinged No 3 folding schools rugby goalposts. 10m steel hinged No 2 folding rugby goalposts. 7m steel hinged folding heavy duty goalposts. 11m & 13m steel hinged folding rugby goalposts. Steel combination rugby and football socketed goalposts. Demountable hinged folding aluminium rugby goalposts. Aluminium hinged folding lightweight rugby goalposts. Millennium aluminium hinged folding rugby goalposts. Combination PVC football and rugby practice posts. PVC lined foam filled safety 1.8m rugby post padding. Replacement rugby post socket caps and cover lids. Professional heavy duty rugby scrum training sled. Heavy duty professional rugby scrum machine. Centurion rugby training PVC tackle shields & pads. Digitally operated electric rugby match scoreboards.